Today was an amazing day. One of those unexpected, joyful events happened here in Guatemala. An event that will have a lasting impact on my experience living here in Xela for a week to learn Spanish and understand Guatemala’s rich culture. Being away from home, I completely forgot that March 8th is a special day for women around the world. It is International Women’s Day. Thus, I was fortunate to be here on “El dia de la muter” and witness the grand celebration that is happening all across Guatemala and the world today. The celebration and promotion of women’s rights and an end to violence against women. Since I’ve been in Xela, I’ve learned a lot about a woman’s life in Guatemala. My fantastic Spanish teacher, Lili told me some surprising details of what it is like for most women to live in Guatemala. There are several issues regarding women’s rights that need to be resolved yet are very complicated since many problems are engrained in their Latin culture. Guatemala, like most latin countries, has a strong culture of Machismo and is very conservative. Thus women are not always treated as equals. Most women in Guatemala, regardless of status and/or profession do not understand their rights or if they do understand them are afraid to do anything. Violence against women is very common and tragic. Many women suffer beatings and some are even killed if they do not comply with their husbands wishes. The murder rates are high thus women are afraid of reporting domestic violence to the police. To further aggravate the problem, many women working at factories are exploited in their jobs earning under minimum wage and working long hours with no benefits or health insurance. They are trapped in a horrible situation and are also often sexually abused by their bosses. Oftentimes, they have to submit or else they will be fired. Lili also told me that it is quite common for men to have mistresses that they frequent or even prostitutes which greatly puts women at risk for developing diseases or other health problems. Generally, women are expected to produce a large family and sometimes if a woman refuses or tries to use contraception, she is beaten or even killed. Mayan women have it even harder as almost 90% are illiterate and uneducated. Many Mayan children today still do not attend school further aggravating the problem. Most Mayans are very poor and live a hard life outside of the city in farming communities and villages. Although they still maintain a rich culture that has lasted for centuries, the life of a Mayan woman is quite hard. Despite the law created in 2007 to protect women against violence, little has changed due to fear and a vicious cycle of being trapped in a culture that hasn’t changed much in regards to women’s rights. If a woman is poor, uneducated and has no job along with five or six children, how could she possibly leave her husband? She must accept the violence. On a positive note, many groups have formed to help educate women on their rights and support women who suffer mentally and physically from abuse. Women have services available at their church and at local and governmental levels, if they choose to speak out. Furthermore, today was the largest demonstration and celebration of El dia de la mujur en Xela. There were women, girls and even men and boys all together, representing all walks of life. It is not only a Mayan problem. Violence and mistreatment of women is very common and happens to many Guatemalan women. It is a tragic problem that will take some time to solve since it is so engrained in the culture. Lili believes that boys and girls must be educated at a young age that they are equal and they must treat each other with respect. That is the only way that women will ever have equal rights. Let’s hope all women can have the same rights as men and be treated fairly with kindness and respect! Here are my photos from the spectacular celebration in Xela, as women from all walks of life came together to celebrate and fight for women’s rights, together as one. 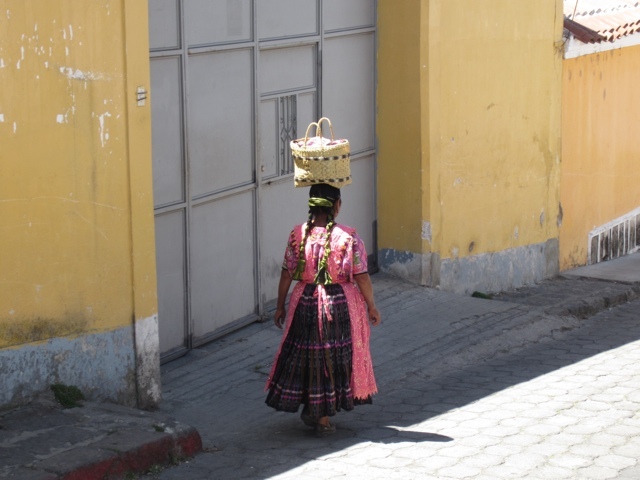 A Mayan woman walking down the street.